Congratulations Democrats and Progressives — You Won. Do not accept any narrative other than one of a big win from hard-fought campaigns. Democrats elected an unprecedented number of women, including two Muslim women, turned at least 6 state legislatures blue, demanded the Medicaid Expansion to Obamacare in three red states, and passed referendums in favor of recreational and medical marijuana and an increased minimum wage in several states. More than half of eligible voters in the U.S. turned out to cast a ballot in the 2018 midterm elections, a record-high in modern history. Michael McDonald, an associate professor of political science at the University of Florida, estimates that 118 million people voted in the midterms, about 50.1 percent of eligible voters. That turnout is about 11 points higher than the average for midterm turnout of 39.4 percent in at least the past three decades, since 18- to 20-year-olds became eligible to vote. In 2014, 83 million people turned out to vote. That’s the highest recorded rate for the midterms since 1914 when turnout was 50.4% and women didn’t have the vote. Update: As of Friday, December 7, 2018, with only one House race not yet called — North Carolina's 9th Congressional District where the state elections board has been been investigating allegations of election fraud over mail-in absentee ballots in the November general election — Democratic candidates earned 60,721,208 votes in House seats across the country in the 2018 midterms, compared to Republicans’ 50,987,044, according to raw data compiled by the Cook Political Report, an independent, non-partisan political analysis website. Republicans lost a net of 40 House seats, losing control of that chamber of Congress by nearly 9 percentage points in popular vote, 53.4 percent to 44.9 percent; and while they gained Senate seats, Republicans go from the 52-48 majority they enjoyed at the beginning of the 2017-2018 cycle to 53-47 next year — despite one of the most favorable Senate maps in a generation. Republicans received the same kind of “thumping”they got back in 2006, and similar to the “shellacking” Republicans gave Democrats in 2010. They midterms delivered a divided government for the 2019-2020 term. And that divided government takes away leverage Pres. Trump and Republicans might have in any budget shutdown fight. If there’s a shutdown, House Democrats under Speaker Pelosi’s leadership can pass a clean continuing resolution to fund the government — and dare Senate Majority Leader Mitch McConnell to oppose it. Elections, after all, do have consequences. In 2018, Democrats earned a new record turnout victory in a midterm House election, surpassing the Democratic Party’s win over Republicans by more than 8.7 million votes in 1974, just months after President Richard Nixon resigned from office in disgrace. The national House vote margins in the midterm wave years of 1994, 2006 and 2010 were R+7 points, D+6.4 points and R+6.6 points, respectively. Democrats also rolled up nearly 16 million more votes in U.S. Senate races nationwide. 25 states recorded 50% turnout or higher with Colorado (62.2%), Minnesota (64.3%), Montana (62.1%), Oregon (61.3%) and Wisconsin (61.2%) exceeding 60%. Historically, the midterms have always had a weaker turnout than presidential elections — but not so much this year. Nate Silver says media missed massive ‘blue wave’ while covering ‘stories about Trump voters in truck stops’. It Was A Big, Blue Wave: Democrats Pick Up Most House Seats In A Generation. Young voters (18-29) supported Democrats by 44 points in 2018, up 18 points from 2016. Moreover, white young voters gave Democrats an impressive 26 point margin in 2018. For that matter, Democrats were also +9 on white voters 30-44. That means Democrats carried all white voters under 45 in 2018 and quite easily at that! As polling sources suggest, Democrats carried white college voters in 2018 (+5) with a solid shift relative to 2016. Both white college women and men contributed to this shift but the largest contribution was by white college women. White noncollege voters, on the other hand, continued to be a problem at -26, only a slight improvement over the previous election. Among nonwhite groups, Asians showed the largest support gains for the Democrats. But, contrary to the exit polls, Hispanics showed a slight slippage in support. Democrats carried suburban white college voters by 7 points, representing a strong 12 point shift over 2016 in the Democrats’ favor. This is more less as expected. But by and large, the strongest shifts in the Democrats’ direction were within rural areas! 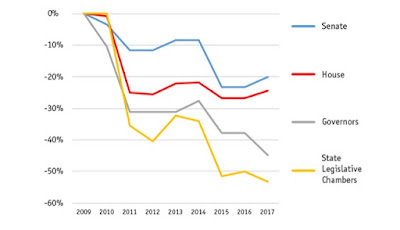 Comparing overall urban vs. suburban vs. rural areas, the respective pro-Democratic shifts were 1, 5 and 7 points. You see roughly the same pattern when comparing urban whites vs. suburban whites vs. rural whites. You even see a 7 point shift toward the Democrats among white noncollege rural voters! Even more amazing, the Catalist data show a 25 point shift toward the Democrats among rural 18-29 year olds and a 17 point shift among 30-44 year olds. Most mind-blowing of all, Democrats actually carried rural 18-29 year olds in 2018 by 8 points. Research from the United States Elections Project, which tracks historical trends in turnout nationwide, reports that 46.3 percent of Texas' voting-eligible population cast ballots in the 2018 midterm. That figure, while up significantly from the 28.3 percent of the voting eligible population that voted in the last midterm election, still represents turnout far below the national average of 50.3 percent. Despite Texas' turnout growth, it lagged in total turnout, finishing 44th out of 51. While final results from across the nation have been slow to finalize, they show that Democrats had perhaps less of a blue tsunami wave election and more of a rising blue tide that will continue to rise through the 2020 election and beyond. It was clear on Election Night Democrats would win control of the U.S. House, but the scale of the victory was initially under reported by the mainstream media. Why did the media initially report Democratic wins were underwhelming? Mainly, several marquee Democratic candidates the media had built up in the final weeks leading to election day did not score election night victories. Beto O’Rourke, the most hyped Democratic candidate of the cycle, lost his U.S. Senate race against the incumbent Sen. Ted Cruz. O’Rourke's loss wasn’t unexpected — an O’Rourke win would have been an epochal surprise — but that loss in particular took some wind out of hopeful Democrats' sails. In Florida, polling showed the gubernatorial candidate Andrew Gillum and Senator Bill Nelson both with an edge, but when election night results came in, they were down. Neither race is officially called yet, and the Senate contest is headed to a hand recount, but Republicans Ron DeSantis and Rick Scott lead in those two races, for governor and Senate, respectively. In Georgia, Democrat Stacey Abrams also trailed Republican Brian Kemp in a close, and closely watched, race. Even so, the blue tide of Democratic midterm wins keeps rising. Democrats have gaining at least 37 U.S. House seats as of this writing, for a total of 232 seats — 14 more than is needed for a majority — with three competitive races; where Democrats lead in the ballot counts not yet called. Heading into the November 6, 2018, midterm election, Republicans held a 235-193 advantage over Democrats in the 435-member U.S. House. All 435 seats — including seven vacancies — were up for election, with Democrats needing to add 23 seats to win majority control of the chamber. In winning control of the U.S. House, Democrats flipped congressional districts long-held by Republicans. Lucy McBath turned in a win over Republican Karen Handel — who had beaten Jon Ossoff in the heavily covered 2017 special election in Georgia’s Sixth, a long held Republican district. Texas Democrat Colin Allred, a former NFL player making his first run for elected office, stunned incumbent Republican Pete Sessions to win his long held 32nd Congressional District in Texas. In another Texas-sized flip, Texas Democrat Lizzie Pannill Fletcher unseated 18-year-incumbent Republican Rep. John Culberson in the Houston-area race for Texas Congressional District 7, a district held by Republicans since George H. W. Bush took over the district in the November 1966 election. The very cradle of Reagan Republican conservationism and the birthplace of Richard Nixon, California’s Orange County, turned blue with Democrats wining all seven congressional districts within or that overlap into that densely populated county, including stalwart Republican Rep. Dana Rohrabacher's 48th District. Republicans no longer hold any House seats in New England, Axios reports, indicating that the party’s shift to the right since President Donald Trump’s election has pushed out more moderate conservatives. The final GOP representative was unseated by Democrat Jared Golden in Maine’s 2nd Congressional District Thursday. Golden was declared the winner by about 3,000 votes, NPR said, after taking into account Maine’s new ranked-choice voting system. Democrats could have done even better in the midterms if it weren't for gerrymandering. Of all New England’s U.S. Senate seats, Republicans hold just one: Susan Collins of Maine, who faces a reelection in 2020. Some Democrats, including Obama’s former National Security Adviser Susan Rice, are already considering a run against Collins. Last month, the senator disillusioned many of her more liberal constituents when she cast a vote vital to putting conservative Supreme Court Justice Brett Kavanaugh on the bench. Arguably the biggest win for Democrats since Donald Trump was elected is Democrat Kyrsten Sinema’s come-from-behind win in the Arizona race for the U.S. Senate seat being vacated by the Republican Jeff Flake. For the past fifty years, Arizona has been the anchor of the Sun Belt pro-business, anti-tax libertarian conservatism that Barry Goldwater pioneered. Sinema is the first Democrat to be elected to the Senate from Arizona since 1988, and the first Democrat to win an open Senate seat in the state since Dennis DeConcini was elected, in 1976. The firsts don’t stop there. Sinema, a forty-two-year-old congresswoman for Arizona’s Ninth District, will also be the first female senator from Arizona, and the first openly bisexual senator from anywhere. Last week, in a multi-candidate field, incumbent Republican U.S. Senator Cindy Hyde-Smith for Mississippi finished with 41.5% of the vote, to Democrat Mike Espy’s 40.6 percent. Espy is an African American former congressman who just might take that Senate seat from the Republican. Because neither candidate reached the 50% threshold in the November 6th election, there will be a special election on Nov. 27, which is just a few days away. Hyde-Smith is noted for making a statement on the campaign trail that it might be a “great idea” to make it harder for some people to vote, and, in an implied reference to her African-American opponent, said, “If he [referring to a local white rancher] invited me to a public hanging, I’d be on the front row.” Mike Espy taking this Senate seat would overshadow Sinema’s Arizona Senate seat win. Nationally, Democrats lost a lot of ground in statehouses under Barack Obama’s presidency, with about 1,000 legislative seats across the nation flipping to Republican control from 2009 through the 2016 election. After the 2016 election, Republicans controlled a record 67 (68%) of the 98 partisan state legislative chambers in the nation — 36 senate chambers and 31 house chambers — more than twice the number (31) in which Democrats had majority control, according to the bipartisan National Conference of State Legislatures (NCSL). During 2017 and 2018, Republicans held more total state legislative seats in the nation, well over 4,100 of the 7,383, than they have since 1920. 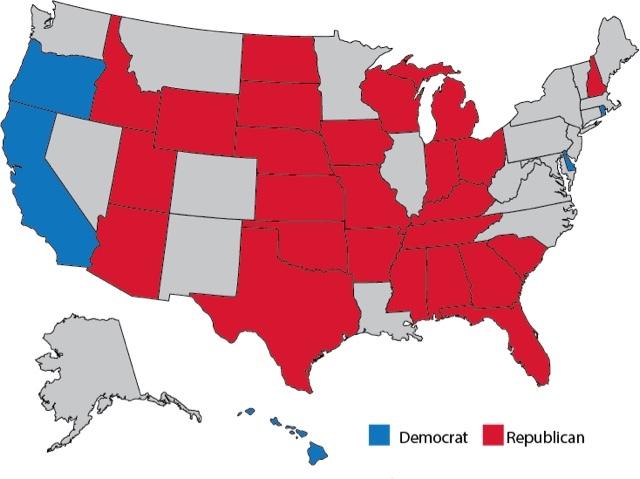 Democrats held total control of just 13 state legislatures. Republicans held state government trifectas — where one political party holds the governorship, a majority in the state senate, and a majority in the state house — in 26 states, and Democrats held trifectas in only 8 states, with divided partisan control in the remaining 16 states. 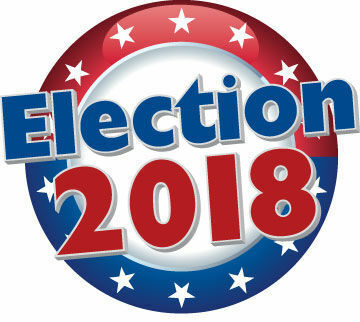 From 2009 through the 2016 election, Republicans had gained control of the gubernatorial office in 33 states, a record high last seen in 1922, and flipped 69 Democratic seats in the U.S. House seats to Republican control, and flipped 13 Democratic seats in the U.S. Senate to Republican control. In the 2018 midterms, Democrats started to get some of it back — but the party still has a lot catching up to do in 2020. Unprecedented Midterm Election Early Turnout - Is It Enough? 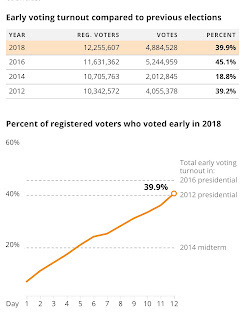 Americans cast in-person and absentee ballots during early voting this year at rates unprecedented for midterm elections since early voting was instituted. With the conclusion of early voting, almost 35 million ballots have already cast nationwide, with Election Day still to go. In 22 states, including Texas, and Washington, D.C., with an early voting period more people voted early than did so in the last midterm election, reports the New York Times. That means more people have cast a ballot over 12 days of early voting in those counties than turned out for the entire 2014 midterm election. And early voter turnout has surpassed that from the 2012 presidential election. In Texas, both Rep. Beto O’Rourke (D-TX) and incumbent Sen. Ted Cruz (R-TX) say the state’s unprecedented early turnout gives their campaigns the advantage. Texas is historical a deeply conservative state because more progressive Texans seldom if ever vote - particularly in midterm elections. Because Democrats rely heavily on the votes of younger people and minorities, who are less consistent in their voting than are older whites, Democratic Party candidates usually benefit from higher turnouts. As a result, Democrats hope the record early turnout supports their much-hoped-for blue wave. Early voter turnout in this midterm surpassed early turnout for the 2012 presidential election across Texas and in Collin County. In the entire early voting period, 5,808,588 (36.8%) of Texas’ 15,793,257 registered voters cast early ballots, according to TargetSmart. That’s 1.1 million more votes than were cast during the entire 2014 election. The rate of early voting turnout for this midterm rivals presidential year early turnout and far exceeds total midterm year turnout rates since 1994 for Texas and Collin County. In the entire early voting period, 4,514,930 Texans cast in-person ballots and 369,598 cast mail-in ballots in the 30 Texas counties with the highest voter registration counts, where 78 percent of the state’s registered voters live. Durning early voting, 39.9 percent of the 12.3 million registered voters in those 30 counties cast their ballots. There are 16,628,103 people over age 18 living in these 30 counties. The early voting numbers are giving a boost of optimism to O’Rourke supporters, who are seeing it as a sign that he may very well come out on top in the closely watched race against Cruz. Nate Silver's FiveThirtyEight website predicts as many as 7.14 Texans will vote in the this midterm election, which would be 2.4 million more than voted in 2014. But, if current trends hold, some 3 million more people will vote this year in Texas than did during the last midterm, in 2014. Texas Early Turnout Day 8 - Blue Wave Yet? Going into the second week of early voting, it has become increasingly clear Texas is in the midst of an unprecedented turnout midterm election. Texans in some Texas counties have waited in lines for hours to cast their votes. The result has been record-breaking midterm vote totals across the state. As of Monday, day eight of early voting, 3,354,029 Texans have cast in-person and by-mail in ballots in the 30 counties where most registered voters in the state — 78 percent — live. That preliminary turnout has surpassed the total votes cast in those counties during the entire two-week early voting period in the last midterm election in 2014. So far this year, 27.4 percent of the 12.26 million registered voters in those 30 counties have voted. We still have too little data to predict the specific election outcomes or the long-term effect of this unprecedented outpouring of voter interest, but we know for certain that Texans are fired up and ready to vote. This state generally sees fewer than 39 percent of registered voters regularly participating in midterm elections. Historically, midterms have been viewed as a referendum on the party occupying the White House. This political axiom seems magnified this year as Donald Trump has made every effort to nationalize this midterm. Trump’s name is not on the ballot, but the president clearly is casting a big shadow on this election. Texas Early Turnout Day 4 - Blue Wave Yet? 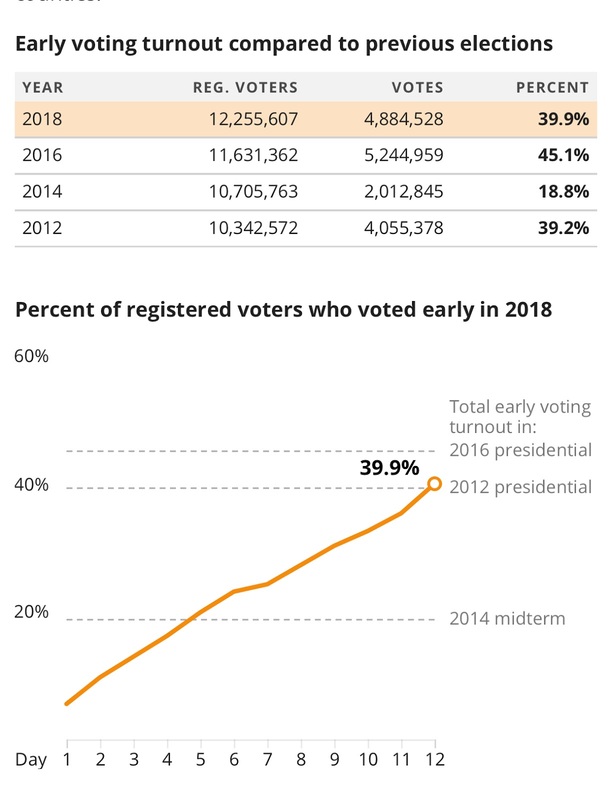 Early voting in 2018 midterm general election turnout and enthusiasm are unusually strong among both Republicans and Democrats across the U.S., including Texas. As of day three of early voting, 1,344,741 Texans have cast in-person ballots and 240,601 cast mail-in ballots in the 30 counties where most registered voters in the state — 78 percent — live. That turnout equals 79 percent of the total votes cast in those counties during the entire two-week early voting period in the last midterm election in 2014. So far this year, 12.9 percent of the 12.3 million registered voters in those 30 counties have voted. If turnout rates remain at these levels, we could see presidential election year turnout levels across Texas and the U.S., which would be virtually unprecedented. Texas Democrats have been losing midterm elections by more or less a two-to-one turnout margin since Ann Richards lost her 1994 Gubernatorial re-election to George Bush. Democrats can chalk up their long losing streak to one thing: Only about one in three Texans registered to vote have cast ballots in midterm elections over the last quarter century, and it's Democrats who haven’t been turning out at the polls. With a crush of last minute voter registration applications submitted to county election offices in last 30 days before the October 9th registration deadline, a record 15,793,257 Texans are registered for this midterm election. That is a 4 percent increase over the 15.2 million who were registered for this year’s March primaries and an increase of nearly 13 percent (1.8 million) over the last midterm year of 2014. The registration increase for this midterm outpaces the 6 percent (1.4 million) overall voting age population (VAP) increase across Texas. In the last four midterm elections, between 33.6 percent and 38 percent of registered voters actually showed up to vote. If this year’s turnout is within those bounds, 5.2 million to 5.9 million Texans will vote. That would break the 5-million-vote mark for the first time, but it would still mean that 9.7 million to 10.4 million registered voters in the state of Texas — slightly less than two-thirds of them — signed up to vote without actually getting themselves to the polls. And that would be bad news for Democrats, because it means their voters stayed home for yet another election. To win Texas, Democrats must get their voters to turnout in a midterm election year for the first time. Beyond the traditional turnout levels of 33.6 percent to 38 percent of registered voters, Democrats must change the electoral math to get more than one in ten registered voters to vote for Democrats rather than their usual Republican choice, or stay home and not vote Republican as usual, or vote for the first time in a midterm, or be a first time ever voter — or all the above. With nearly every utterance, Donald Trump affirms the conclusion we reached two years ago that he is temperamentally and intellectually unfit to serve as president of the United States. But there he is, a year after his inauguration, waging a war of words with the world from behind the Resolute desk in the Oval Office. He has denigrated fellow citizens and international allies; threatened nuclear war; undermined public faith in the judiciary, Congress, and the media; found some “very fine people” at a gathering of neo-Nazis; and dispensed utterly with the idea of presidential gravitas. In fact, there’s been so much public attention paid to his tweets, to his character and temperament, to the ongoing investigations into how he came to power, that close scrutiny has sometimes lagged into what this administration has actually done. The Donald Trump presidency is now one year old and in many respects ― the unhinged tweeting, the contempt for democratic norms, the potential collusion with a hostile foreign power ― it has been unlike any presidency in history. But there is one respect in which Trump’s tenure in office has been rather ordinary: his administration’s year-long effort to push familiar Republican initiatives that shift money and power towards corporations and the rich, and away from everybody else. No, this is not the kind of presidency that Trump promised. As a candidate, he portrayed himself as a different sort of Republican, one who would attack the financial industry, govern independently of wealthy special interests, and protect public programs on which poor and middle-class Americans depend. The tax cut law that President Trump boasts will make his wealthy friends “a lot richer” is just the latest in a series of betrayals of working people by the administration and Congress since Trump took the oath of office on January 20, 2017. In addition to passing a massive tax cut for wealthy business owners, Trump and Republicans in Congress have rolled back important worker protections, advanced nominees to key administration posts who have a history of exploiting working people, and taken other actions that further rig the system in favor of corporate interests and the wealthiest Americans. Click Here for the 10 worst things Congress and Trump have done to undermine pay growth and erode working conditions for the nation’s workers. In November of 2015, Larry Harmon, a software engineer then in his late 50s, went to the polls to vote against an Ohio ballot initiative to legalize marijuana. It had been a few years since Harmon voted. He cast a ballot for President Barack Obama in 2008, but didn’t particularly care for the candidates in 2010, 2012 or 2014, so he didn’t vote. When he went to the polls for the marijuana initiative in 2015, officials said he couldn’t vote. He had been removed from the voter rolls. Even though he had lived at the same address for well over a decade, officials wouldn’t let Harmon cast a provisional ballot and so he left his polling place without voting, went home and later wrote an angry letter to Ohio Secretary of State Jon Husted (R). Ohio officials removed Harmon from the voter rolls in part because he failed to vote in federal elections over six consecutive years. One of the ways Ohio polices its voter rolls is by sending a confirmation notice to anyone who fails to vote in a federal election after two years. If the person fails to respond to that notice and also fails to vote over the next four years, they get removed from the rolls. That process is being challenged in a consequential case the Supreme Court will hear on Wednesday: Husted v. A. Philip Randolph Institute. Harmon and civil rights groups argue the Ohio process violates federal law, which explicitly says people can’t be removed from the rolls just because they haven’t voted. Husted and others who defend the law say Ohio’s process is reasonable because people aren’t removed just for not voting ― they have to fail to respond to the mailer as well. A Supreme Court ruling on the legality of the process could help clarify how aggressively states can purge their rolls and the limits the federal government can set on how states maintain lists of eligible voters. The nation's middle class, pillar of the U.S. economy and foundation of the American dream, has declined over the last 38 years to the point now where it no longer constitutes the majority of the adult population. As families increasingly struggle to pay the bills from month to month the American middle class is continually shrinking. It has become exceedingly clear that “the American Dream” is dying and the future is dimming for ordinary hard-working Americans. Republicans loudly tell American voters they want to “make American great again.” But it is the conservative trickle down Reaganomics agenda that has increasingly enriched the rich by relentlessly reducing the ability of government to provide a fair and level economic playing field for American middle class workers. 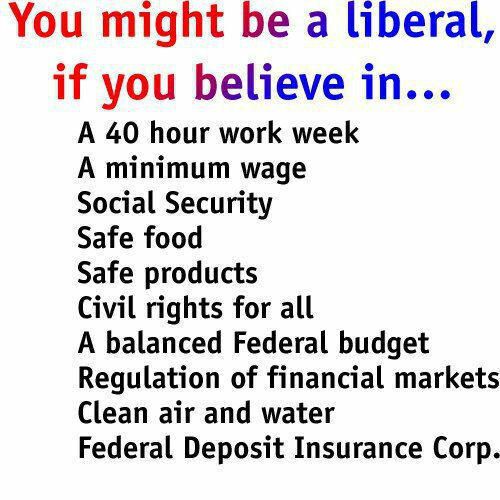 Government now works for the wealthiest Americans and multinational corporations, not American middle class workers. Over the last 38 years, Americans have been working harder, producing increasing levels of economic growth, but they’re not getting rewarded with any extra pay. Between then and now, productivity, or the amount of economic output generated by an average hour of work, grew 72.2 percent. On the other hand, pay for the typical worker rose just 9.2 percent. 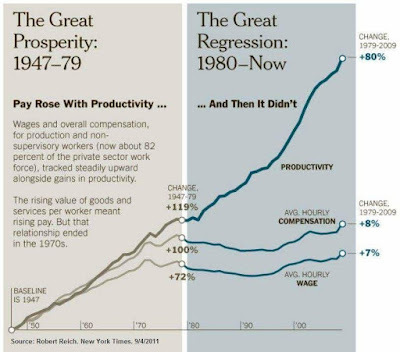 Things have gotten even worse since 2000: net productivity has grown 21.6 percent since then, yet inflation-adjusted compensation for the median worker grew just 1.8 percent. When Republicans cut taxes, wages go down or stay flat for working people. Ultra-rich billionaires who own the Republican Party know that when working/middle-class people get a tax cut, it means that over time working-class wages will go down – which is why they’re more than happy to give us all a temporary tax cut. Is Manufacturing’s Future All Used Up? Of all the titans of our new Gilded Age, the only one to attain the status of culture hero was—and still is—Steve Jobs. This wasn’t simply a function of his personal magnetism, though he certainly outshone such apparently amiable schlubs as Bill Gates and Mark Zuckerberg, and the cipher that is Jeff Bezos. It was also because, unlike his fellow creators of cyberspace, Jobs produced the tactile, palpable portals into cyberspace. He made things—handheld objects that changed people’s lives. If those 700,000 were employed directly by Apple, of course, then Apple would be the world’s largest manufacturer. Instead, Apple conceals its factories—and responsibility for the working conditions there—behind two Chinese walls. First, it subcontracts its production work to Foxconn, a Taiwan-based company. Second, as Joshua Freeman notes in Behemoth, his fascinating history of factories from 18th-century Lancashire to 21st-century Guangdong, the massive factories of Foxconn City in Southern China are off-limits to journalists and other prying eyes. It was only the wave of worker suicides there in 2010 (many committed by workers hurling themselves from the roofs of their dormitories, which Foxconn sought to counter by installing nets beneath the roofs) that brought, however briefly, this immense complex of factories to public notice. Read the full story at The Prospect - Is Manufacturing’s Future All Used Up? 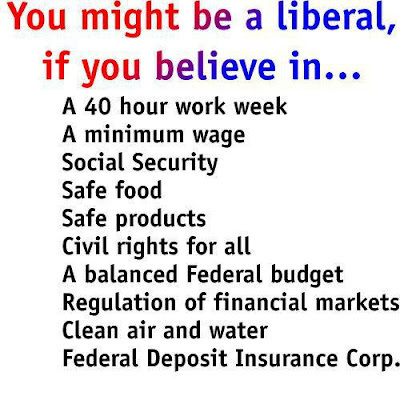 Democrats stand for many things that are popular with a majority of Americans. They oppose cutting tax rates for the wealthiest taxpayers and multinational corporations. They oppose changes to Medicare and Social Security that would reduce future benefits or notably alter eligibility requirements. They oppose laws that disenfranchise voters and restrict reproductive healthcare access and choices. And they want some immigrants, known as "dreamers," to be able to stay in this country. But there are hard questions for the Democrats. What exactly is their health-care policy likely to be in the future? 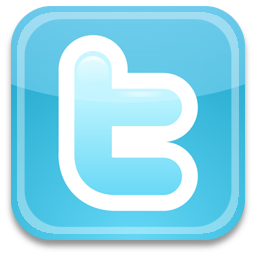 Expand Medicare and Medicaid benefits for senior citizens? Stand pat with the 2010 Affordable Care Act that still leaves at least 30 million Americans without healthcare, or move toward a Medicare-for-all type of plan. What is their economic policy, other than rhetoric about helping working families? What is their response to concerns among many workers about the impact of automation and globalization that leaves increasing numbers of Americans without employment. What is their response to the weight of student load debt carried by so many, and tution costs that put college and trade school access increasingly out of reach of young Americans. Democrats see a divided Republican Party led by Trump as an easy target for criticism. For now, that will remain the principal focus heading into the midterm elections. But as they begin what amounts to a three-year campaign cycle of midterm elections followed by a critically important 2020 presidential race, will Democrats be forthright in assessing and dealing with their own vulnerabilities? Read more at WaPo - Democrats think 2018 will be a good year, but are they realistic about their own problems? A formula you say? There’s a formula for a blue Texas? Well, sort of. I mean this in the sense that a sober quantitative accounting of the challenge Democrats face in Texas provides a useful guide to how the blue Texas goal can actually be attained. More useful I think than the countless breathless accounts of grassroots Democratic organizing in Texas, which make little effort to explain which groups have to move and by how much to be successful. So here’s the “formula”. In 2016, Clinton improved over Obama in Texas, reducing his 16 point deficit in the state to 9 points in 2012. How did she do this? The dataset developed at CAP for our Voter Trends in 2016 report indicates that Clinton improved over Obama among both white non-college-educated and college-educated voters. The Democrats’ deficit among Texas’s white non-college-educated voters fell from 60 points in 2012 to 55 points in 2016. The shift toward Clinton among white college graduates in the state was even larger—from a 30-68 percent deficit in 2012 to 37-57 percent in 2016, a margin improvement of 18 points. The white college-educated improvement cut Clinton’s deficit in the state by about 4.5 points and the white noncollege improvement moved things in her direction by about 1.5 points, for a total shift of 6 points toward Clinton from better performance among whites. The rest of Clinton’s gains relative to Obama were accounted for by improvements in Latino turnout and support. A bipartisan group of six senators has introduced the “Secure Elections Act,” to eliminate insecure paperless voting machines from American elections while promoting routine audits that would dramatically reduce the danger of interference from foreign governments. The bill reads like a computer security expert’s wish list. Computer scientists have been warning for more than a decade that these machines are vulnerable to hacking and can't be meaningfully audited. States have begun moving away from paperless systems, but budget constraints have forced some to continue relying on insecure paperless equipment. The Secure Elections Act would give states grants specifically earmarked for replacing these systems with more secure systems that use voter-verified paper ballots. The Democratic National Committee Unity Reform Commission was created by the delegates to the 2016 Democratic National Convention. The Commission was chartered to review the Party’s presidential nominating process. The commission held meetings through 2016 and adopted a report of recommendations during its final meeting in December 2016. These recommendations on how the Party will select delegates to the 2020 Democratic National Convention, who will select the Party’s next presidential nominee, will now proceed to the DNC Rules and Bylaws Committee for consideration. The rules committee will meet through 2018 and create its report of 2020 delegate selection rules to the full body of DNC members by August 2018. Those rules will specify how the Party will conduct 2020 state primaries and caucuses, and to what extent superdelegates will have a role in selecting the Party’s next presidential nominee. Dems Wonder: Is Opposing Trump Enough To Win Primaries? One of the most significant questions facing Democratic candidates and voter in House races this year is whether running against Donald Trump — something nearly every House Democratic candidate will promise to do — will be enough to secure primary victory when two or more Democrats are running for the same congressional seat, or state legislative seat? Can congressional and legislative hopefuls win over primary voters on criticism of Trump alone, or are the increasingly influential (millennial) progressives right when they say Democratic voters demand something more? The 2016 presidential campaign generated a daily Republican reality show of theatrics that drove up voter registrations and turnout in Texas that year. In Texas, a record-breaking 15 million people registered to vote before the November 2016 presidential election. According to the Texas Secretary of State, that was 78 percent of our voting-age population, and more than 1.3 million additional registered voters than four years earlier. Voter turnout for the 2018 Texas Democratic Primary likely will exceed turnout numbers of past midterm primary years. If the more progressive millennial voters really care about their issues, they will have to register and vote for primary the candidates who support those issues. If millennials don’t bother to vote in the 2018 Texas Primary, they are likely to end up with “me too conservative” Democrats on their November 2018 ballots. February 5th is the last day you can register to vote in Texas primaries. Early voting for the Tuesday, March 6, 2018 primary election will begin on Tuesday, February 20, 2018 and run through Friday, March 2, 2018. Read more here: McClatchyDC - Dems wonder: Is opposing Trump enough to win primaries? From the late 1980s to 2016, “centrist” neoliberal ideas held hegemonic sway among the Democratic elite. But the economy created by this ideology — and the ensuing crises — is a major reason why Clinton lost to Trump and the party is completely out of power today. This obvious failure has provided an ideological opening that the American left has been eager to fill. Now Democrats must decide how to move forward. Should it follow Elizabeth Warren's lead and promise a return to the trust-busting ways of the early 20th century? Or should it emulate the more sweeping, Nordic-style politics of Bernie Sanders? Or perhaps the Democratic Socialists of America are right and something even more extreme is needed. The Week is publishing a four-part series to examine the Democratic Party‘s failures and analyze the potential for Democrats to transform the country. Early voting for the Tuesday, March 6, 2018 Democratic and Republican primary elections will begin on Tuesday, February 20, 2018 and run through Friday, March 2, 2018. All of Texas' state executive officers and state representatives, and half of the state senators will be up for election, as well as a United States Senate seat, and all of Texas' thirty-six seats in the United States House of Representatives. A number of county level offices will also be on 2018 ballots. Want to be an election worker? In the final weeks of 2017, voters in Virginia, New Jersey and Alabama turned out in record numbers for off-year and special elections that, perhaps, forecast the mood of voters nationwide for 2018 midterm elections. Voters in Virginia, New Jersey and Alabama altered the United States Senate. Lone Star State Democrats and Republicans will next test the mood of voters with the earliest primary election in the nation. Only one other state, Illinois, holds a primary in March, two weeks after Texas' primary. Texas Democrats will decide who will carry the Democratic party's banner into the battle for governor and a record number of other congressional, statewide and legislative, and county offices in the nation's biggest GOP stronghold. Texas has 10 Democrats running to determine who will take on Gov. Greg Abbott, who himself faces minor opposition from two Republicans in the GOP primary. Dallas County Sheriff Lupe Valdez and Andrew White, the son of former Gov. Mark White, are two of the best known names in the race for Democrats. At the federal level, Democrats have the opportunity to remake the state's Congressional delegation with 8 open congressional seats up for grabs, even though most are in districts heavily gerrymandered to favor Republicans. Democrats are running in all 36 of Texas' U.S. House races, for the first time in 25 years. One of the most watched races in Texas will be for the U.S. Senate where Ted Cruz faces his first re-election test since his stunning 2012 victory against Lt. Gov. Dewhurst. Four lesser known Republicans are running against Cruz in the Republican primary. On the Democratic side, El Paso Democrat Beto O'Rourke first needs to get through a primary with two other Democrats to get to his highly anticipated battle with Cruz. Many races up and down Democratic and Republican primary ballots across Texas have multiple Democrats and multiple Republicans running against each other. At least one, and often two or more, Democrats are running for 133 of the state's 150 House of Representatives seats and 14 of the state's 15 state Senate seats. More than 346 Young Democratic Texans have filed to represent Texans in county courts, county parties, the Texas House of Representatives, the Texas Senate, and U.S. Congress. Of the more than 346 Young Democrats running: 36 are running for Congress, 55 are running for the Texas House of Representatives, 5 are running for the Texas Senate, and Many other offices up and down the democratic ticket. Young Democrats are poised to run the largest youth targeted voter turnout plan for 2018. We know that young voters are more progressive and will soon be the largest voting block- we’re prepared to get folks voting now, not later. Most of the races with 3 or more Democrats running for the same office are likely to go to a runoff election on May 22nd, when no candidate gets above 50 percent of the vote. What the turnout looks like in the Texas primary will tell a lot about what lies ahead for Republicans and Democrats in Texas and the nation in 2018. If there is big Democratic voter turnout — traditionally low in Texas gubernatorial cycles — it could signal that the higher than expected turnout among those Democratic voter cohorts for Doug Jones in Alabama’s special election to fill that state’s open U.S. Senate seat is in fact a developing trend nationally that could have significant impact on the November election. Similarly, primary turnout among suburban white men and women, with and without college degrees, who helped elect Donald Trump in 2016, will tell Republicans, and Democrats, much. If those traditional Republican voters turnout in numbers for the the primary, it signals they will likely turnout again in November to help Republicans comfortably carry that Election Day. But if those Republicans don’t turnout, Republicans on November ballots face an usually tough midterm year, not just in Texas, but nationwide. For the 2016 primary election, Collin County had 501,000 registered voters. Registrations increased to 540,000 for the November 2016 election. Projecting from historic averages, Collin County will likely have about 560K registered voters for the 2018 primary election and 585K registered voters for the Nov. 2016 election. High Democratic voter enthusiasm this year, combined with higher voter registration numbers and Democratic primary ballots packed with candidates, will likely drive record turnout numbers for the Democratic Party of Collin County's 2018 midterm primary election. 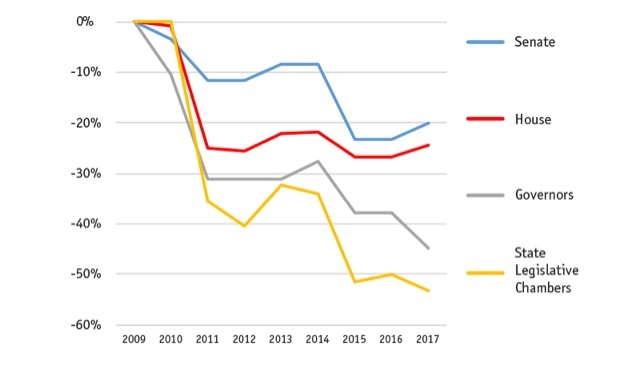 With the exception of the 2008 Primary election, Republican Primary Election turnout has far outpaced Democratic Primary turnout in Collin County for the past quarter century. But Democratic Primary turnout this year could well approach Republican turnout numbers of past midterm elections. Republican Primary turnout for the last midterm election in 2014 generated 46,459 Republican ballots cast. That's compared to 9,584 Democratic ballots cast in the Democratic Primary that year. Total primary election turnout could top 80,000 with about 40,000 ballots cast by Republicans and an equal number of ballots cast by Democrats - and it could be more. That would equal or exceed the 40,185 ballots cast by Democrats in the 2016 Presidential Primary Election. My assumption is this is a Democratic wave year. Wave elections have that special designation because like a tsunami swamps land they swamp voting trends set by past elections. Like a tsunami, they are driven by energy generated from a major seismic event in national politics. This year, Trump is that seismic event. We can’t look at Collin in isolation. Exceptionally high Dem turnout and lower GOP turnout for all the 2017 special and uniform elections around the US suggests 2018 is a Dem wave year. Consider 2010 GOP wave election turnout in context to prior midterm elections. GOP Primary turnout that year was more than triple prior midterm years. 2010 GOP turnout was even higher than 2008 GOP primary turnout. GOP turnout jumped an energy state in that wave year. Consider too Collin’s jump in registered voters since the 2014 midterm. The registration count for the Nov 2017 Election was 540K - and that was after the county purged 40k registration records preparing for the 2018 Registration Card mailing. I think the registered voter count will increase to 560K before the Feb 5th cutoff date. (Our 2014 primary registration count was a lackluster 435K.) Our registration count on Feb 5th and last minute registration application activity during January will be predictive of turnout too. Total primary turnout of 15 percent lines up with the last few primary years, including the 2010 GOP wave year. I think that is reasonable, and perhaps low in context of election turnout trends through 2017. Turnout of 15 percent pegs our total primary turnout at 84K ballots cast. I’ll be shocked of that skews mostly to GOP ballots cast. And, more Dem candidates are on primary ballots for more offices in Collin, and across TX, than any time in nearly a generation. If all those candidates are actually out campaigning and canvassing voters to GOTV, (like Republican tea party activist did in Collin 2010 like republicans never had before) that will add to Dem turnout enthusiasm already generated by the Trump effect. I think GOP turnout enthusiasm will be generally down this year, as it was through all the 2017 elections. And, I think Dem Primary turnout will at least equal 2016 Primary turnout, just as 2010 GOP wave Primary turnout more than equaled 2008 Primary turnout. There isn’t much time for candidates on primary ballots to gain name recognition — early voting starts on Tuesday Feb. 20th. Half or more of in person voters cast their ballots during early voting in Collin County and other suburban counties around the state. Thousands of senior Texans and Texans in the military and overseas, will begin marking their absentee mail ballots by mid-January. Military and overseas ballots must be out by Jan. 20th according to the Texas Secretary of State's election calendar.